I had “one of those nights”. I was awakened far too early this morning and then couldn’t get back to sleep. Rather than toss and turn for hours, I simply got up and started my day. I’m very glad I made that choice, as I have accomplished a lot in the last few hours. I’m also convinced that if I had restlessly stayed in bed, I would have been super cranky when the alarm went off at 6:30am. Today’s schedule is full of duties such as taking the grandkids to school and daycare, attending a planning meeting with LUSH Valley, finish pruning fruit trees and vines plus de-junking our workshop is high on the priority list. If I could get the day’s three meals covered, it would prevent interruptions and free up a lot of my time. I opened my fridge and searched for inspiration. There was a couple of pieces of mushroom-spinach quiche from last night’s dinner and a crisper drawer full of carrots. The quiche will satisfy hungry-man hubby, so all I really need to prepare is a soup, salad and snack option. 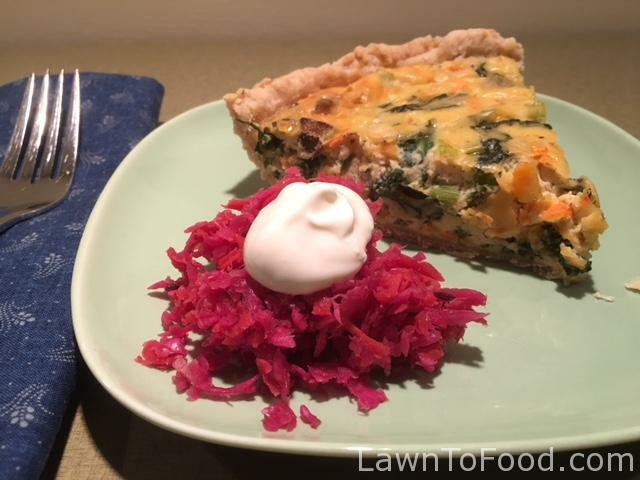 Mushroom-spinach quiche with fermented cabbage and greek yogurt. I brought the organic carrots out of the fridge and started washing and grating them. 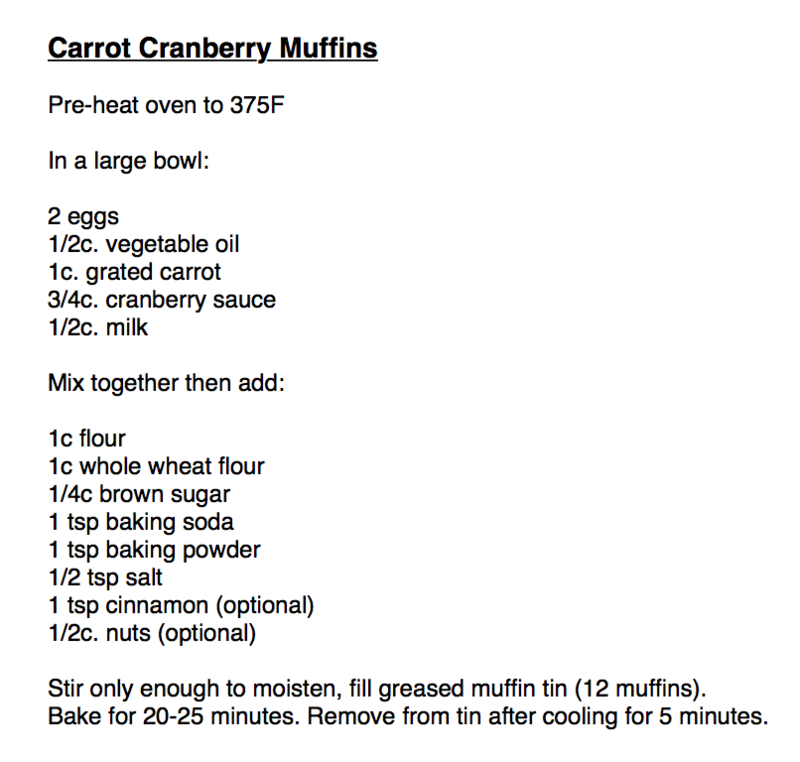 During the grating process I decided to make Carrot & Parsnip Soup, Asian Carrot Slaw and Carrot Cranberry Muffins. A few handfuls of grated carrot along with a chopped onion, grated parsnip and a sprinkle of dried herbs went into the soup pot. 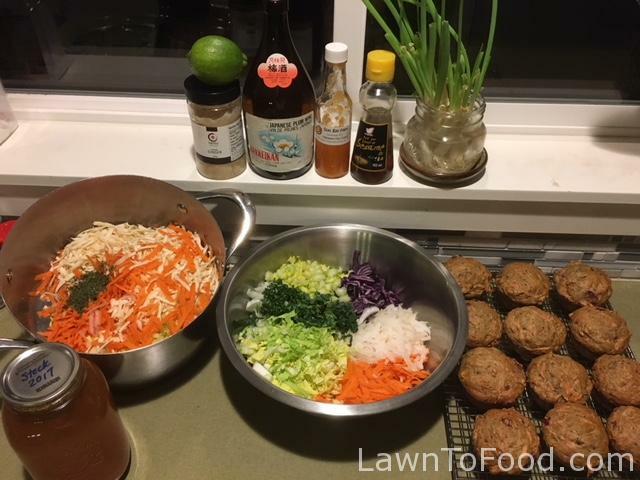 A large handful of grated carrot went into the slaw salad bowl, with grated daikon radish, purple cabbage, napa cabbage, celery and our garden kale. I used the remaining 1c. of grated carrot and some leftover cranberry sauce, that I found in the fridge, to make muffins. On the left, is the pot of soon-to-be Carrot Parsnip soup. It’s ready for a jar home-made stock, plus water and then will spend the day simmering on the back burner. In the centre is Asian Slaw and I have lined up salad dressing ingredients along my window sill. Pickled Ginger, Lime, Japanese Plum Wine, local Seal Bay Farm Habenaro Sauce, Sesame Oil and fresh Green Onions. The Carrot Cranberry Muffins baked up in 25 minutes, which was just enough time for me to get all the dishes washed, dried and put way. My day of meals is done! Now, it’s time to taste test one of those muffins!